The Río Verde is a pristine, clear green river that carves through untouched Colombian rainforest. The river is accessed from a steep, jungle canyon and makes for an incredible 2-day multi-sport adventure. The trip combines hiking with pack-mules, whitewater rafting thrilling Class IV rapids, and swimming in the warm emerald water as you float downstream. After breakfast, meet your bilingual professional rafting and hiking guide at Cra. 43e #11-13, Medellín, Antioquia, Colombia at 8 am and drive 2 ½ hours to the town of San Francisco. Enjoy a delicious picnic lunch in the jungle. Start the adventure by hiking down the valley while pack-mules carry the gear. At the river, refresh with a swim in the emerald green water that gives the river it’s name. Learn about river safety with your professional raft guide. Raft through a pristine mountain rainforest. Jump off high boulders and explore narrow canyon. Make camp riverside and enjoy a delicious and hearty meal to keep you well fueled for the day ahead. 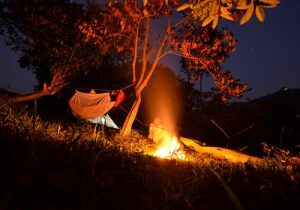 At night fall asleep to the orchestra of the jungle in sheltered hammocks. Wake up with a swim in the river while a fresh breakfast is prepared. Enjoy a beautiful canyon hike up a side creek of the Green River. Begin rafting the Rio Samana which starts once you depart camp. Explore secluded beaches and swim in hidden waterfalls. Keep your eyes peeled for tropical animals and exotic birds in one of the most bio-diverse countries in the world. As you continue a ½ day raft trip down river, witness traditional gold mining practices. At the end of the second day, arrive at Puente Samaná, the only road access over the river. Meet our driver here to return to Medellín (3 hours). Extend your 2-day Río Verde trip by 1 day and 1 night for less travel on Day 1 and a more relaxed first day. On Day 1, start the adventure in San Francisco with a mule ride or hike to visit traditional sugar cane, “panela” farmers. That night, stay overnight in San Francisco at a finca with a pool and comfortable rooms (showers & bathrooms). 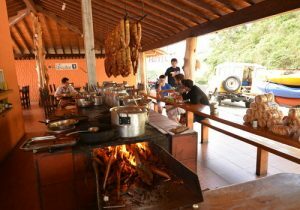 Enjoy home-cooked meals and a visit with a Colombian family. The next day, start a 2-day river rafting trip on the Río Verde. No prior rafting experience is needed. Must be 16+ years old and minors need parental consent.